I want to visualise insert sizes in my mate-pair library and calculate statistics like mean, standard deviation.. I have found this tool http://blog.malde.org/posts/bamstats.html that makes beautiful graphs like the one above (the plot shows mate pair library - green - contaminated by paired end reads in red). However, based on output of this program it seems that there are plenty of paired-end reads in my library and only few mate-pairs (orientation outwards, outies on the plot). I want to verify this with another tool. Picard's CollectInsertSizeMetrics works only for paired-end reads according to manual. What are other possibilities? Any suggestions are welcome. I need three things: estimated mean (after removal of outliers), standard deviation (again after removal of outliers) and visualisation. Both, histograms and boxplots work for me. Am I missing something? Is there any way that's a little more straightforward to install/compile Bamstats? Did you figure out how to install this? Please let me know if you get this thing working. Try Qualimap. It computes mean, median and standard deviation of the insert size. 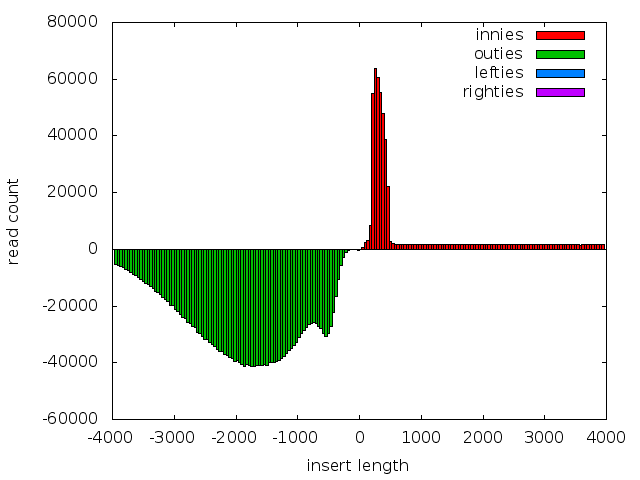 Additionally it computes the histogram of insert sizes and plots insert size across reference. How to determine the total average insert size from differently divided from one fastq data pool to each reference?